On the 8-9th July 2011 21 people from Durham Amateur Rowing Club competed at in London in the Henley Masters Regatta. Hosted by Upper Thames Rowing Club, the regatta has been held on the week following Henley Royal Regatta since 1994. The well-known regatta has grown into an internationally recognised event for veterans or masters crews. Competitors come from all over the world to compete at this two day event. The 21 rowers, made up from eleven men and ten women rowers and their universal cox Emma Watcham this year travelled to Henley with high hopes of victory. During this two day event DARC was represented by 7 crews. A women’s masters A 4+ of Becks Lippe, Di Dzanovic, Jane Scott and Toria Lloyd, a masters B 4+ of Becks Lippe, Nat Burgess, Judith West and Toria Lloyd, with Gill Prescott and Aillie Ord from Strathclyde doubling for a D 2x, Gill Prescott raced in the D 1x and the Masters E 8+ who all finished within six feet of their winning opponents in the heats or the finals. 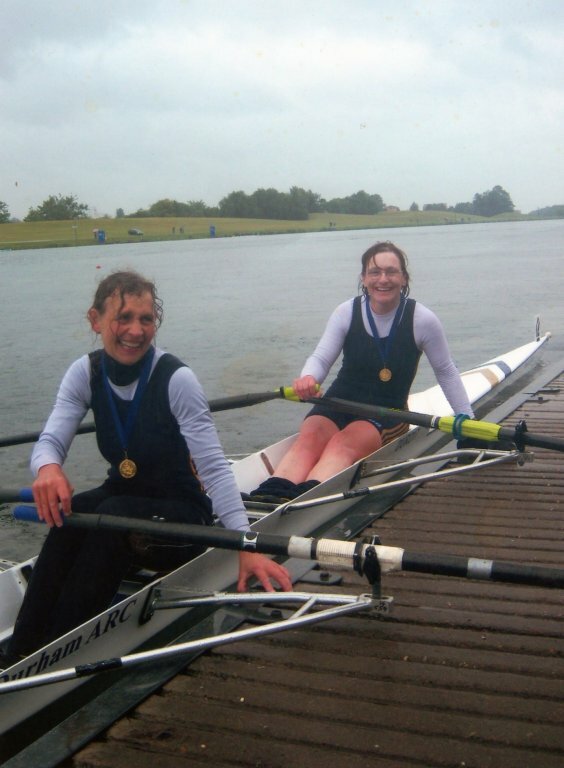 Then with 2 crews remaining victory finally come home in the form of the women’s D 4x who had four minutes of side by side racing with neither crew surrendering before the Durham crew of Hazel Stainforth, Judith West, Carolyn Edwards and Dajana Dzanivic finally beat the crew from Lea rowing clubby 6 feet. The men’s F8+ who won silver, beaten by one second at the National Championships and were finally rewarded when, a length and a half ahead, they came storming past the finish line in first place consisting of Derek Gordon at bow, Paul Rutter, John Watkinson, John Appleby, Dave Walker, Martin Judson, Kim Metcalfe, with Paul Stanley at stroke and Emma Watcham coxing. This entry was posted in Racing News on July 25, 2011 by admin. 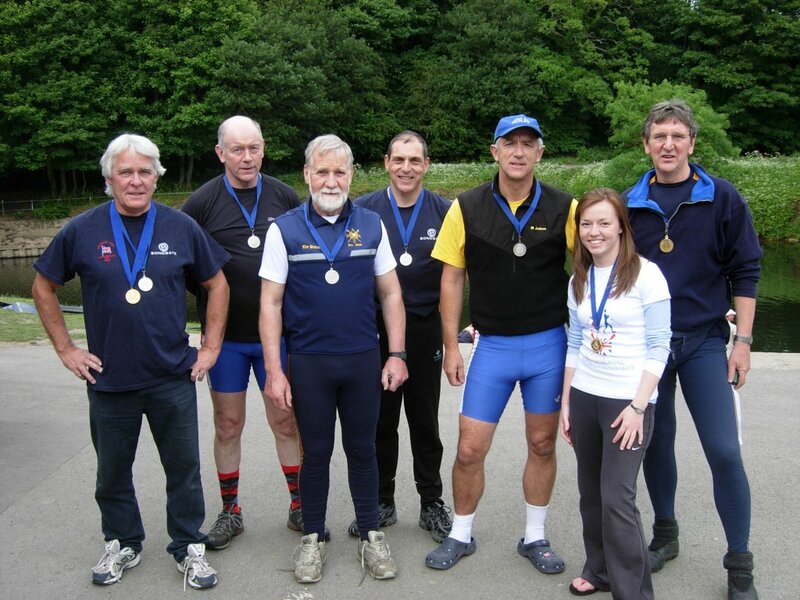 DARC bring home 8 Golds 5 Silvers plus the Victor Ludorum from the National Masters Championships 2011 in Nottingham. On what was a deceptively sunny day, members from DARC travelled to The National Water sports Centre in Nottingham, located on the river Trent. 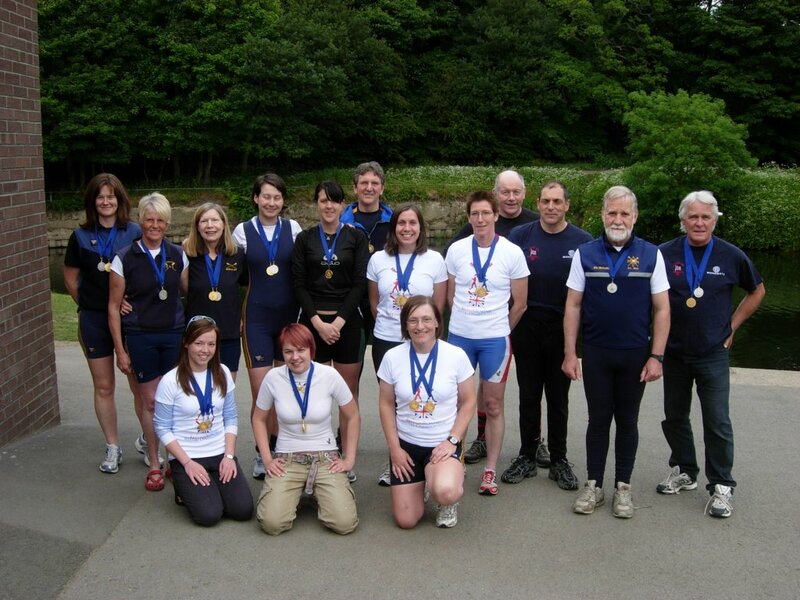 It was here that the British Masters Rowing Championships 2011 were to take place on the 12 June 2011. Set in parkland, Holme Pierrepoint is one of five National Sports Centres which are part of Sport England’s strategy to create an elite English grown world class sporting talent. The centre provides a multi-lane regatta lake, a water ski lagoon with course, jumps and ski cableway and a multi-purpose white water canoe slalom course. 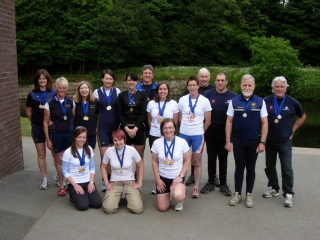 This year Durham Amateur Rowing Club entered a record 12 crews in this prominent event in the rowing calendar, competing with crews from Upper Thames Rowing Club, Eton Excelsior RC, Grosvenor RC and composite crews from Derby, Leander, Runcorn and Northwich Rowing Clubs. Racing commenced on a sunny morning at 9.06am for DARC with the women’ s Masters C 2x (double) competing in their first heat. As the day progressed and medal wins mounted and the weather turned into what could be the wettest Masters Championship in living memory with 25.4mm of rain according to the Met Office. Although this wasn’t enough to dampen DARC’s spirits. They carried on their winning form throughout the day. The crews consisted of a women’s masters E novice 1x Caroline Scholl, coached by Geoff Graham a women’s masters A 4+ consisting of Becks Lippe, Dajana Dzanovic, Jane Scott, Toria Lloyd and cox Steph Burgess, a women’s masters B 4+ of Becks Lippe, Nat Burgess, Judith West, Toria Lloyd and cox Steph Burgess both crews coached by Martin Tyler. Coached by Geoff Graham in this her first race in a single and first time on a multi-lane course Nicki Trewhitt won the masters B nov 1x by 10 seconds. Other gold medal winners were women’s masters D 1x Gill Prescott coached by Geoff Graham, a masters E 1x Martin Tyler, a women’s masters F 2x Hazel Stainforth and Carolyn Edwards coached by themselves and a women’s masters B novice 2x of Caroline Scholl and Nicki trewhitt coached by Geoff Graham who all won gold in their races. With silver place being awarded to the woman’s masters C IM3 2x Gill Prescott and Helen McMillan coached by Geoff Graham who missed out on Gold place by 1 2ooth of a second, the masters E 8+ being Paul Stanley, Tim Baker, Martin Judson, Dave Walker, Dave Coverdale, John Watkinson, Paul Rutter, Jed Gargan and cox Emma Watcham coached by themselves, the masters F/G 8+ of Paul Stanley, Kim Metcalfe, Martin Judson, Dave Walker, Dave Coverdale, John Watkinson, Julian Ringer, Derek Gordon and cox Emma Watcham coached by Jed Gargan and a women’s masters D 4x- (coxless quad) with Hazel Stainforth at stroke followed by Judith West, Dajana Dzanovic and Carolyn Edwards at bow coached by themselves. By the end of racing the DARC rowers had secured 8 gold and 4 silver medals. L to R Paul Stanley, Dave Walker, Kim Metcalfe, Jed Gargan, Martin Judson, Emma Watcham and Derek Gordon. This entry was posted in Racing News on July 1, 2011 by admin.